WASHINGTON (CNN) -- A member of Congress Friday called on the State Department to stop doing business with Xe, the North Carolina-based security company formerly known as Blackwater Worldwide. 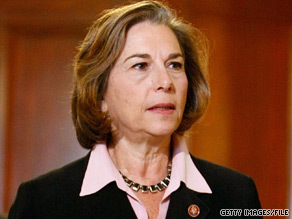 Rep. Jan Schakowsky, D-Illinois, on Friday urged the State Department "not to enter into further contracts" with Xe. Rep. Jan Schakowsky, D-Illinois, asked Secretary of State Hillary Clinton whether the State Department had just signed a new $20 million dollar contract with Xe for Iraq, saying she is "very concerned" that the State Department may be signing new security contracts with Xe, both in Iraq and Afghanistan. "I urge you not to enter into further contracts with Xe and to immediately review any existing contracts," the letter said, according to a copy provided to CNN. "The behavior and actions of both the company's leadership and a number of individuals employed by the company have harmed our mission in Iraq and Afghanistan and endangered the lives and welfare of our troops and diplomatic personnel serving overseas." The State Department decided in January not to renew a personnel protection contract with Blackwater, as the company was then known, when it expired in May. That decision came amidst an investigation by both U.S. and Iraqi authorities of a 2007 shooting involving Blackwater guards in Baghdad in which 17 Iraqis were killed. The company has repeatedly denied any wrong-doing. The State Department did not immediately respond to a request Friday for reaction to Schakowsky's questions and criticism. The State Department had said that it would continue a Blackwater air-support contract after the much-larger personnel protection contract ended. Xe spokeswoman Stacy DeLuke told CNN that, "Right now we have no contracts with the State Department in Iraq." DeLuke said the company would review calls for bids to provide security for U.S. officials in Afghanistan. "The thing is we are totally open to bidding on some of the contracts that may come up in Afghanistan just like anyone else," DeLuke said in a telephone interview. The Nation magazine released an article Friday that said the State Department had signed a new contract for Iraq with Xe for $20 million to extend an earlier aviation contract. "The State Department contract is scheduled to run through September 3. In May, the State Department announced it was not renewing Blackwater's Iraq contract, and the Iraqi government has refused to issue the company an operating license," the article said. The controversy over the role of Blackwater in Iraq was revived earlier this week by a lawsuit filed in Virginia by two former employees accusing Blackwater guards of smuggling weapons and using excessive force in Iraq. And the lawsuit claims Blackwater founder Erik Prince "views himself as a Christian crusader tasked with eliminating Muslims and the Islamic faith from the globe." Xe said in a statement that it would respond "to the anonymous unsubstantiated and offensive assertions put forward by the plaintiffs," in a brief to be filed August 17. Blackwater changed its name to Xe in February.